Jackrabbits can be found in the American West and Southwest and the Plains States. Jackrabbits, which are actually European hares, are larger than rabbits indigenous to the United States. While rabbits burrow beneath the earth, jackrabbits spend most of their lives above ground. You may hunt jackrabbits throughout most of their range. In many places, they are considered nuisance animals, so there are few restrictions on how many you may kill. In most areas, all you need is a valid hunting license, a rifle or shotgun, and a little know-how on hunting jackrabbits. As with any game animal, check with your state's Department of Natural Resources about legal hunting seasons and regulations. Find a good hunting spot. Jackrabbits prefer open fields because they rely on speed and their keen senses to elude predators. Farm fields are a prime location. Obtain permission from the landowner before hunting on any property other than your own or state land. Farmers often grant permission to hunt jackrabbits because the animals forage on crops. Other suitable locations include open fields, prairies, or deserts. Scout for jackrabbits. Use binoculars if you have them. Set yourself up on the highest ground available and look for jackrabbits in the surrounding field. Jackrabbits often hide in small patches of brush. Look at the bottom of scrub or brush. If you don't find jackrabbits this way, try whistling. You may whistle yourself or use a referee-style whistle. 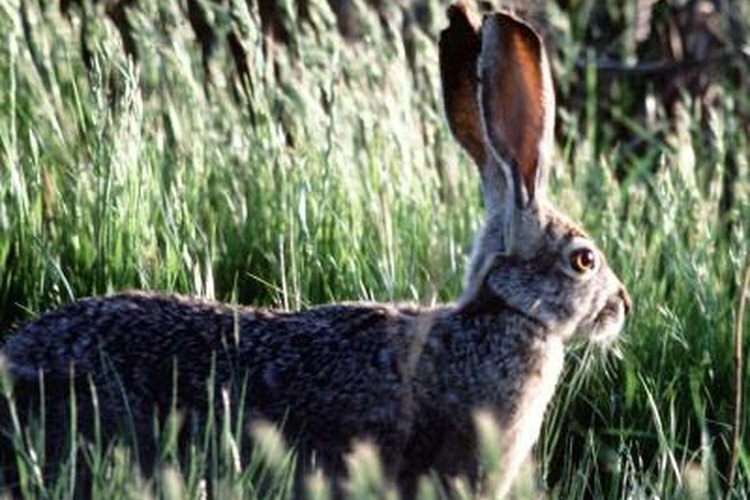 Often, shrill noises cause jackrabbits to lift their ears, trying to locate and identify the sound. The tips of jackrabbit ears are black, and are the easiest part of the jackrabbit to spot. If you are hunting on a warm day, you will often find jackrabbits in the open, sunning themselves. Scare jackrabbits out of the brush by running dogs or walking through the field and whistling if you don't see them while scouting. If you are using hunting dogs, they will scare the jackrabbits out of the brush. If you are running rabbits without dogs, walk slowly near brushy areas of your hunting location. Stop every 30 paces or so and whistle. This will often cause jackrabbits to lift their ears. Sometimes it will flush them out of the brush. If you have a shotgun (or if you're an extremely good shot with a rifle) you can take a running shot. Otherwise, wait for the jackrabbit to stop. Don't chase jackrabbits. They will keep running if they hear something is pursuing them. If you stay still, jackrabbits will often stop running to try to spot you. Jackrabbits are easiest to hit when they have stopped running. Choose a hunting weapon appropriate for your shooting and hunting experience and style. If you prefer scouting jackrabbits and shooting them while they are standing still, a small-caliber rifle such as a .22 will work best. If you prefer to scare jackrabbits out of the brush, use a shotgun.